DOWNLOAD IS NOW AVAILABLE !!! What exactly determines health? 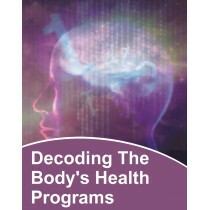 What are the components supporting what the body experiences as ill health. We live in controversial times regarding health practices; food choices. Although the diet matrix plays a significant role, the condition of health is really about the body's response to underlying energetic patterns. Each condition, imbalance, discomfort or disease is a frequency pattern. The question should then be what is it that supports the pattern; where does it all spring from. The method of deriving fuel from food is really a secondary process one which we have come to rely on as a final option in sustaining the body. However there are even more compelling features in maintaining the vessel of the body. There are options and capabilities which far exceeds the food matrix program. Join us for another profound and enlightening workshop. Come away with a knowing that your experiences are based on unrealized components and that you have the potential to change those experiences. Be open and ready to dive into yourself.